95th AG BN (Reception) conducts reception operations for Basic Combat Training, Advanced Individual Training, and English as a Second Language Training Soldiers. Conducts physical fitness retraining and the Physical Training and Rehabilitation Program for the brigade. Provides medical quarters, separations processing, medical shuttle service, and facilitates CBHS-F services for the brigade. On order, increase reception capability in support of the training base expansion. The 95th Adjutant General Battalion (Reception) was constituted in the Army of the United States during World War II. Originally designated as the 95th Replacement Battalion, the unit was activated at Camp Cooke, California, on 27 February 1944, and deployed to France to process soldiers as replacements into theater. When the war in Europe concluded, the battalion was inactivated in France on 9 November 1945. On 1 January 1976, the United States Army Reception Station, Fort Sill, activated and began administrative in-processing for new soldiers entering active duty. On 5 March 1987, the battalion reorganized under the regimental system as the 95th Adjutant General Battalion (Reception). The mission of the battalion expanded on 27 February 1995 when the Trainee/Student Processing Branch of the Fort Sill Military Personnel Division transferred to the 95th AG Battalion (Reception). 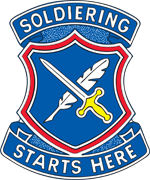 Until 1 October 2001, the battalion provided personnel service support to all Initial Entry soldiers from arrival through graduation, as well as supporting officer and enlisted students attending professional development schools at Fort Sill. On that date, responsibility for student officer and enlisted management shifted to the installation Adjutant General. On 21 October 2001, the 95th Adjutant General Battalion was tasked with the mission of expanding the training base by providing IRR processing in support of Operations Noble Eagle, Enduring Freedom, and Iraqi Freedom. This was accomplished with the elements of the 95th Division (IT) mobilized to Fort Sill. The battalion was located in the old Artillery Officer Candidate School area (Robinson Barracks) until 2014 when the battalion moved in to a new $33M Reception Complex which was built to accommodate all the FCOE agencies supporting the reception process under one roof. The 95th AG Battalion (Reception) is one of only four reception battalions in the active duty Army.